A great snack or afternoon treat, this Honey and Pistachio-Peanut Butter Snack Bites recipe is full of flavour combining peanut butter with honey, pistachios and cinnamon. A quick and simple recipe to make for your family. Mix peanut butter, honey and cinnamon in medium bowl until blended. Stir in remaining ingredients. 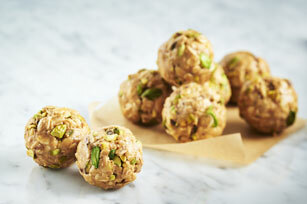 These easy-to-make Honey and Pistachio-Peanut Butter Snack Bites can be refrigerated up to 1 week before serving.